The Argentine ant, Linepithema humile (formerly Iridomyrmex humilis), is a dark ant native to northern Argentina, Uruguay, Paraguay, and southern Brazil. It is an invasive species that has been established in many Mediterranean climate areas, inadvertently introduced by humans to many places, including South Africa, New Zealand, Japan, Easter Island, Australia, Hawaii, Europe, and the United States. The worker ants are about 1⁄16 inch (1.6 mm) long and can easily squeeze through cracks and holes no more than 1 millimetre (0.039 in) in size. Queens are two to four times the length of workers. These ants will set up quarters in the ground, in cracks in concrete walls, in spaces between boards and timbers, even among belongings in human dwellings. In natural areas, they generally nest shallowly in loose leaf litter or beneath small stones, due to their poor ability to dig deeper nests. However, if a deeper nesting ant species abandons their nest, Argentine ant colonies will readily take over the space. Argentine ants are one of the trailing ants and may travel 200 feet or more with thousands of ants following each other from the nest to a food source. They prefer sweets and often tend honeydew producing insects. Their diet changes throughout the year. They feed on a number of items and are not considered “picky,” since they are reported to feed on sweets, meats, fruits, dairy products, eggs, animal fats and waste, and vegetable oils. 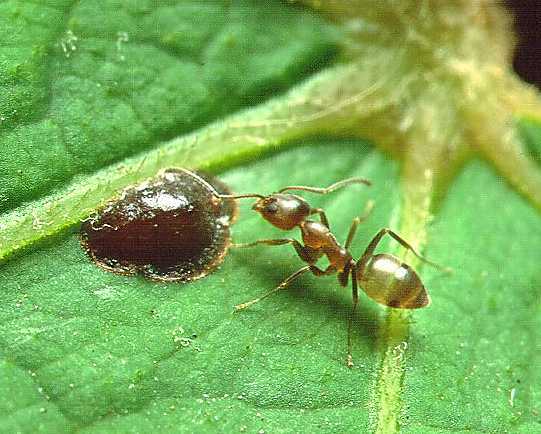 While the workers do not eat a lot, foods the ants have fed on may need to be discarded due to contamination because they also feed on garbage, sewage, dead animals and other items that may carry germs. Outdoors, Argentine ants can be found nesting in moist areas under debris (logs, concrete slabs, trash, and mulch) and in debris (rotten wood, faulty places in trees, refuse piles, bird nests, bee hives, and other places). They can form nests in exposed or covered soil. Argentine ants can form nests under homes and even within the home especially if their outdoor habitat is disrupted. Indoors, Argentine ants crawl on or in every imaginable place such as stoves, refrigerators, shelves, beds, and clothing. Often looking for moisture, Argentine ants may be found on water pipes, dish washers or other wet locations.